Initially Qatar promised to build 12 stadiums for the 2022 World Cup in their bid book that won the country rights to hold the tournament. However later FIFA agreed to scale back the entire event to as few as 8-9 venues. Currently there are 5 approved stadium designs for the tournament: Al Bayt Stadium, Al Rayyan Stadium, Al Wakrah Stadium, Khalifa Stadium and the Qatar Foundation Stadium. Two of them are formally under construction (Al Rayyan and Al Wakrah), while two others have contractors selected (Khalifa and Al Bayt). All of them may be seen below. It’s unclear at this point where the final would be played. 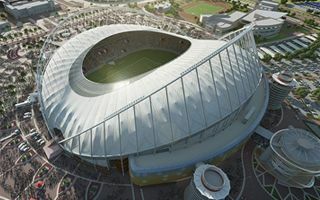 Most likely scenario, as it was in the bid book, is the new Lusail Stadium, subject to perhaps the most challenging design requirements ever for any stadium.